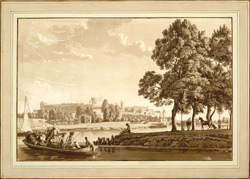 Daniel Defoe visited Eton in the early 18th century, commenting: "The gardens are very fine, and extended from the college down, almost, to the bank of the Thames; they are extremely well planted and perfectly kept." The creator is influential English watercolorist Paul Sandby. His brother Thomas Sandby was Deputy Ranger of the Royal Park at Windsor, and the two brothers lived there. During the 1770s, Paul Sandby produced many views of the castle and its environs.